I’ve expanded beyond the one day a week strength training and three days a week running. I’m keeping the running the same and upping my strength training workouts to three times a week. Like I’ve previously mentioned, I’ve enlisted Tina’s help for online personal training. She has devised a personalized workout that incorporates the couch to 5k workouts I’ve already started and complimented that with a day of upper body supersets, a day of lower body + core supersets and a day of full body supersets. This first week has been interesting for me to say the least. I enjoy the challenge of her workouts, I’m doing exercises I’ve never done before (or was too afraid to try) and for the most part getting through them. I definitely struggled with the bench push ups and the V-ups. I thought I almost threw my back out on my first V-up and decided it probably wasn’t a good idea if I kept doing them. Good thing is Tina is only an email away to answer questions, give support or help with modifications. I’ve been working with a trainer at the gym, but only once a month. It really hasn’t been enough to help me figure out a plan with variety. We’ve moved up machine wise but I still don’t have a lot of different exercises. Tina’s plan gives me the variety I need and she knows what she’s doing. I trust her way more than I trust myself to figure out what to do. Tina’s also really reasonably priced, her training is less a month than my gym membership. I’ve become the crazy girl at the gym that is randomly doing plyometric exercises like jumping jacks, mountain climbers and jumping in place mixed into full body exercises and I LOVE it! I’ve also found the ideal time on Saturday mornings to not have to fight for equipment with all the new years resolutioners, 8 am. Now most people would probably think I’m crazy for getting up and going to the gym that early, but Friday nights are usually my chill night at home, so it makes it much easier to be at the gym early. I’m also really really sore from yesterday’s full body superset workout, I’m blaming it on the incline chest fly to press. My runs this week definitely got much harder. The first two were manageable but the 3rd was 20 minutes, no walking. The previous long run was 8 minutes, so upping that by 12 minutes was definitely scary. I also did that 20 minute run at 6:45 am, my first run before work. It was hard, but like usual I took it slow and made it without having to stop to walk. I always feel so good about myself after that. This week is the last week of intervals and leads up to a 25 min run without walking. That should be an interesting one, but I’ll approach it the same way and I’m sure I’ll get through it. Hey Amy! First, I want to say thank you for stopping by my blog and for your comment love and support. It means more to me than I can describe. 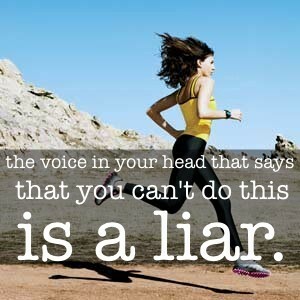 I really like the photo you have ‘ the voice in your head that says you can’t, is a liar”- I can resonate with that. I want to try couch to 5k but honestly keep putting that one off. I could use some of your motivation! I never thought I would ever be running, but I love it now. You can totally do it and it takes 30-40 minutes 3 days a week. If I can do it, anyone can!